Today we are glad to announce the start of Early Access Program for PhpStorm 8. A fresh build 134.1456 is available for download and we are waiting for your feedback in the Issue Tracker. This build includes a bunch of new features, bug fixes and improvements from PHP, Web and IntelliJ platform sides (including long-awaited Multiple Selection – check the end of the post for more details). With Multiple Selection, we can put our cursor in multiple locations in our file and write code simultaneously in these positions. Press Alt+Shift on the keyboard and use the mouse to select the locations of cursors. With Select Next Occurrence or Alt+J (Ctrl-G on Mac OS X) we can add the next occurrence of the current word to the selection and then easily replace it. Hitting Escape lets us work with one cursor again. Please note that Select All Occurrences feature is on the way and will be available in one of the next EAPs. Download PhpStorm 8 EAP build 134.1456 for your platform from project EAP page and please report any bugs and feature request to our Issue Tracker. Please note that 8.0 builds use separate settings folder so either automatic or manual import of settings may be required. 3rd party plugins may or may not be compatible with 134.x builds – please ping plugin authors in case of any problems. We gladly offer them our support. Are there any plans to add (or return back) highlight branch feature to git/mercurial repository browser tree viewer? Oh, I’m sorry for confusion – first link is additional clarification for 2nd link, so http://youtrack.jetbrains.com/issue/IDEA-120681 is the best to follow. Please see discussions in http://youtrack.jetbrains.com/issue/WI-12552 and http://youtrack.jetbrains.com/issue/WI-19893 – this seems to be quite popular use-case. Nice features, the multi-selection mode is very handy. What about Laravel integration (Blade highlighting syntax and so on….)? As you may see in http://youtrack.jetbrains.com/issue/WI-14172 it’s “in progress” now. Blade Syntax Please, the issue it’s marked as “in progress” for decades and nothing was released so far! JetBrains, we really PHPStorm, don’t you ignore us! We hear you, and it’s marked as “in progress” because we work on that and it’s in the near plans. So, can you pleeaase add some L4 integration? There’s quite a big community around it so far, and all of them are waiting for you to acknowledge that! They are available in this EAP build. Do you experience any problems with these features? Bye bye sublimetext. Multiple selection is the bomb! Who the f*** needs multiple selection? Who actually programs like this? This nothing that cannot already be solved just as easily with search & replace. And .. what bothers you about it? If you aren’t using it right now in another tool then do not use it here as well — no one forces you. In any case: it’s an IDE-wide feature and NO PhpStorm developer was involved in this .. so no dev time was taken away from PHP-related features. Typing the same code in multiple locations is quite literally the enemy of DRY. You really have to use the feature to appreciate it. Nothing about this is *not* DRY. An example where I could have used this earlier today: I had just typed out a big long associative array mapping string keys to values. I later decided that I wanted all the keys to be lower case. With this feature I could have selected all the keys at once, and then toggled the case. Without this feature, there’s really no good way to do it. It’s not easy to write a regex that matches arbitrary array keys, and even if I did, I could still only toggle the case on one key at a time. Ok, so you don’t use it so no one needs to? There are plenty of use cases where search/replace isn’t as practical or not fast enough. How about refactoring and fixing someone else’s really bad code? Thankfully JetBrains has doesn’t have such a limited vision on my things. Please remove the Drupal logos from PHPStorm startscreen, a serious IDE should not promote some amateur spaghetti code such as Drupal’s. I liked the old start screen a lot more. You realize that Drupal 8 has been completely rewritten, right? It uses Symfony, Doctrine, Guzzle, Assetic and Twig libraries included via Composer. Yes, we do realize that. And we support Symfony, Doctrine, Guzzle, Assetic and Twig libraries (and Composer tool) for quite a time, much earlier than Drupal 8 has become stable. We’ve performed an investigation of Drupal 8 features and architecture for sure. Is there anything in specific you are missing right now? That was comment to Peter’s question on “You realize that Drupal 8 has been completely rewritten, right?” – may look a bit confusing due to wordpress blogs comments structure. Yes, I clearly understand that you have replied to Peter’s comment. Thing is — he replied to another person and not to JB staff/general comment and therefore your comment looks completely out of place — Peter did not complain (in that comment) about anything. Oh, I see, sorry about that. Where do you see Drupal logos in PhpStorm v8 startup screen? Care to post a screenshot with that? P.S. Yes, it was (well, still is) in v7 .. but not in v8 anymore. But what about editing remote files directly, without having to download them? Sorry, but that it not possible to implement (your “without having to download them”). The file still needs to be downloaded so it can be edited .. just other editors/tools doing that transparently for you in background .. so it looks like it’s done directly on remote side (and this is what they can / should be able to implement .. but not yet in the works …). You do know that if you set up a deployment server via SSH that you can use the built-in SSH console for that? Or download them from the deployment server into your project and then re-upload them? I am trying to startup PHPStorm EAP 8 and it crashes on launch everytime. I converted my existing PHPStorm 7 settings and it is attempting to open all my previously opened projects (that is when it is hanging). Is there a way to startup EAP 8 without opening my previously opened projects so I can see if it is related to the projects or app in general. +1 for Laravel and I believe with Multiple Selections, It just got a lot better for PhpStorm. Keep up the good work! Thanks for Drupal 8 support! I hope that this http://youtrack.jetbrains.com/issue/WI-21681 will be available in PhpStorm 8, as promised. We’ll try our best to make it happen. Thank you. Please, please, please, please, fix this: http://youtrack.jetbrains.com/issue/WI-19953 in 8 version! I hope you guys don’t forget to fix previous new features. Search everywhere is currently not usable, because of search results issues. Sometimes you get results, sometimes not … It’s great to become new features, but it would be even better, when current features work well. We are definitely working on bug fixing of features released earlier. You can look up Search Everywhere related issues by this link: http://youtrack.jetbrains.com/issues/IDEA?q=summary%3A+%22Search+Everywhere%22 – feel free to report any issues missing there right now. Thank you! File Diff works really strange in PhpStorm! Is there anybody started to experience problems with the encoding in PHP after installing EAP? Just wondering if this could happen after the installation. php.ini unchanged. No. All seems good to me. 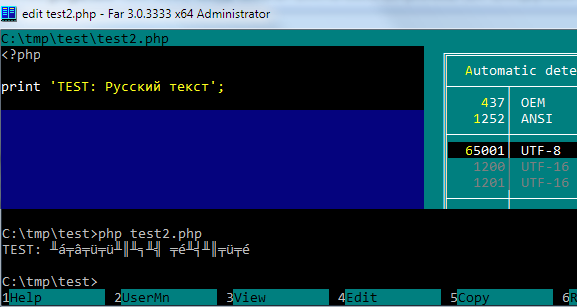 Your PHP file seems to be encoded in UTF-8. But standard DOS console does not seem to understand UTF-8 encoded text. I do not see how PhpStorm can break this for you (unless it uses wrong encoding — then check your settings/encoding for that file). Yes, you right, the codepage was reseted. Based on the fact that CP was 437 (US), it could be due to the Windows Update (as one of the versions). Would kill to get fonts to look as good in PHPStorm as they do Sublime with Linux. Is there a chance for this (http://youtrack.jetbrains.com/issue/IDEA-119601) getting into the mix for PHPStorm 8? Unfortunately, can’t get any estimates on this one. Please stay tuned and watch the issue to get updates. Thank you! Will the WordPress improvements make it into PhpStorm 8.0 or have to wait until 9.0? WordPress improvements will be available in PhpStorm 8.0 (and initially available in one of the next EAPs). Is it possible to register the EAP IDE release? Or what happens after the default 1 month period expires? You can’t register your license in major release EAP build (30-day license is bundled), but we always release the next EAP before the current one expires (and it includes the next 30-day license). Mikhail, so you are saying that EAP builds do not require paid licenses as long as you update the release to the next EAP build before the 30 day license expires? Yes, exactly. We try to make EAP versions as affordable as possible to gather feedback. Tip for anyone using a Debian/Ubuntu VM – you might need to use an alternative desktop environment to Gnome3. Gnome3 doesn’t seem to like the native key combinations for multiple cursors. I’m using VMWare Player, not sure if it affects other platforms. Multiple cursors work wonderfully in xfce. There are no estimates on that right now. PSR-4 is not a newer version of PSR-0. It was never suggested that PSR-4 is a ‘newer version’ of PSR-0, merely that it is a new standard. Any reviews on stability and performance please? Stop trying to push your favorite feature/issue in release news. Why show echo() input ech Enter? Mm, is the -Dshow.all.look.and.feels=true option still works? In phpStorm 7 it returns old LaF named “Alloy. Badouin Theme”. Is there any chance to use that LaF in phpStorm 8+? It has been deprecated, so no longer available in PhpStorm 8. Is the road map at http://confluence.jetbrains.com/display/PhpStorm/PhpStorm+Development+Roadmap going to be updated with PHPStorm 8 new features? Yes, we are going to update it in a few days. I was hoping to find a list of all the builds (need the list of bugs fixed by each of the builds) of phpstorm. can someone direct me as to how can i get that information. You can get all the information in our issue tracker (http://youtrack.jetbrains.com/issues/WI) – check “Fix Versions” field. You can also refer to this blog and navigate to list of fixes from release announcements. Is Live Edit support coming soon? I get errors on restart when installing the plugin. What version of the plugin do you have right now? What does “Early Access Program” mean? Is it like Beta-Version? Will it be in the future automatically a Full-Version, if i put my bought License Code in it? Yes, it’s like Beta-version. You will need to download a full version when it is released, you can’t use license code for early access program version (every EAP build comes with bundled 30-day license, we publish new build before the one you have expires). @Mikhail: Many Thanks! What do you think: When will the Version 8 be a Full Version. Within a year? Is it possible to run PhpStorm 8 beside V 7.x? Yes, they use different config folders. Ok – it works. Thank you! An laravel templates support yet ? Will it get full support in phpstorm 8 ? I am new to phpstorm and I would love to try it. I Notice you support many frameworks. Is there a chance to support Codeigniter in the future? It is one of the most popular frameworks out there. There is no ETA for Codeigniter specific features support, but we do have basic features support for most of well-known PHP frameworks. You can vote/comment for feature request on tracker: http://youtrack.jetbrains.com/issue/WI-1174 . As for extjs, it’s already supported, see: http://www.jetbrains.com/phpstorm/webhelp/using-ext-js-framework.html . This is a good news that you support extjs. I see that Codeigniter is sort of supportable, so that is good too. I will give it a try. I know that lots of people say CI is dead, but it is still used, so having code completion and access to methods, models and views, and simple navigation in project and connected files, is important. From what I read, with some comments, some managed to do it, some did not. I hope it will work out for me. I’m working with an external server (Really it’s a vmware virtual machine) This external server, have a xampp installed. I’m using a LiveEdit plugin but It doesn’t work with an external server. is there are any configuration or any tool that I can use to edit html (wysiwyg) with PHPStorm? Is there any possible to dev a new UI theme for Mac version? What UI theme would you like to see? Yes please. Blade support is a must. Huge influx of users from the Laravel community and I think this would help immensely. Why is it so easy with Sublime Text and not here ? +1 fort Laravel 4 support and its blade templating. Is it possible to have installed both version 7 and 8 EAP? During installation version 8 asks me to uninstall 7 version however if I don’t mark anything to uninstall I still can go to next step. So the question is – if I install it and don’t uninstall 7 version – will both versions work without a problem? I’d like to try 8 EAP but in case something doesn’t work I would like to have access to 7 version. Yes, it’s possible. Version 8 and 7 uses different configuration folders so it’s possible to run them even simultaneously.